Probably the queen of unique hair (and just about every other piece of costuming), Lady Gaga frequently changes how her hair looks. Gaga’s long locks allow her to style it into just about anything she wants. However, I thought the best was when she took “hat hair” to its extreme. Nicki Minaj competes heavily with Gaga for who has the craziest hair. Like Gaga, Nicki has changed her hair so many times that it’s hard to keep track. She’s had it rainbow colored, pink, and as shown in this picture, big and bulb shaped. With all the male artists growing out their hair in the ‘80s, where did that leave the female artists? Apparently they were looking to compete in the big-hair-a-thon as well, if Janet Gardner is anybody to go by. The former lead singer of Vixen decided to wear her hair both long and big in the ‘80s. Jaden Smith might just be starting out in his career, but already he can stand alongside the veterans of big hair. Unlike his father, who has always kept his hair more or less closely cropped, Jaden actually has quite a bit. In fact, he has so much that it almost covers up his face when it goes ‘fro. 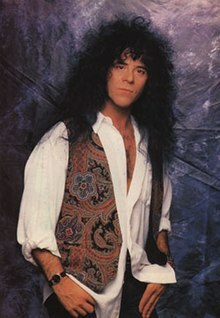 All the members of KISS sported big hair in the ‘80s, but none so much as the late Eric Carr, who was the band’s second drummer from 1980 until his death in 1991. His shoulder length, curly, and voluminous hair was one of the biggest ‘dos among the big hair artists of the time. Loud hair just seems to fit Pink’s personality, as she is known for being very non-conformist when it comes to her career. 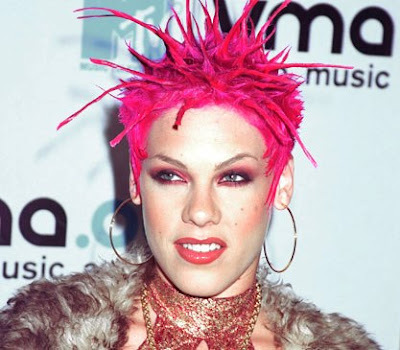 So it’s not so surprising that she once adopted a wildly loud and spiky ‘do of a color that stays true to her name. 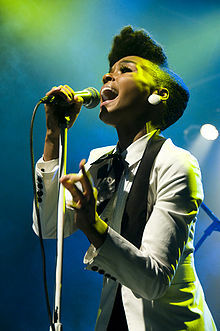 Janelle Monae performing in March 2009. Although it’s not extremely big or loud, Janelle Monae is an artist I recognize right away because of her hair. That, of course, is just one part of the Janelle Monae style, which includes a full tuxedo. With hair that was long in the front and had wings on the sides, Mike Score lived with a style that was a bit like “bed head.” Yet, at a time when everybody else was trying to make their hair as humongous as possible, the Flock of the Seagulls lead singer stood out among the pack. Who did I miss? Tell me about your favorite artist with big or loud hair.